Om Shanti Om Yoga Ashram internationally certified Yoga Teacher Training in India registered with Yoga Alliance, USA confers 300 hours Yoga Teacher Training. This course is suitable for intermediate and advances level Yoga followers. In advance practice, the practice of asanas physically has been claimed to improve flexibility, strength, and balance to alleviate stress and anxiety. In this state, students more understand about to keep the stillness in the body and fluctuation of the mind by Cultivating Yoga practice. 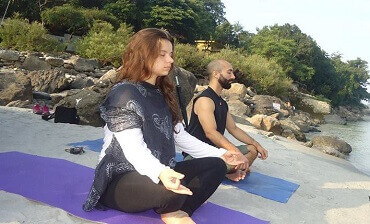 In this level, students are trained deeper into various kind asanas performance about 60 asanas, pranayama and most of all go deeper into meditation level. Going into a higher stage of meditation or relaxation will be the purpose of this course. We emphasize the practice of yogic lifestyle without ego and reducing worldly desires which takes us to attachment and sufferings. Our ultimate aim is to give transformation in the life of students by experimentation and experiences. Anybody who is having a strong thirst to go deeper into yoga science, we provide a retreat to devote to transform your life. We need to understand that the purposes of asana practice are first of all - to form a stable platform for pranayama, mantra chanting and meditation which later practices, in turn, had spiritual goals and secondly to stop the accumulation of 'karma' and instead acquire ascetic power, 'tapas', something that conferred supernatural abilities and curing diseases. Early to bed and early to rise, keep your body and mind healthy and wise as well as cultivating yogic discipline. Wake up early, with taking shower and morning ginger lemon tea is served to provide energy for the day! Beginning the day with Mantra Chanting by surrendering to God the first thing we have to do. Chanting Mantra for spiritual awakening and calming the mind towards creating positivity for the rest of the day. Each day, waking up is already a gift! The word "Prana" stands for life force and this is believed to be the vital energy that enliven the body. This also serves as the link between the physical observance and the mind. ... Once the breath is still, your mind faculty is shut down. The most important practical class, begins with warming up, performing asanas sequence and finally relaxation and shavasana, finishing with chanting Mantra. Students feeling rejuvenated in the end of the class after 90 mins of practice. Yoga Philosophy is an important part to begin the yoga training, knowing the purpose Yoga Training Course, about self understanding, about suffering in life, about culture, Yoga Sutra and most of all discipline of life. Yoga Anatomy is one of important subject to learn about the function of the body, to understand our body and how to utilize it in right way. The subject begins with Digestive System to know what we eat to survive, the Respiratory system to expand our pranic level and Muscular System to perform the asanas with benefits. During the third week, Ayurveda class by Dr Ayurveda, learning about the types of body(doshas), the characteristic, diet, cleansing, daily routine, fasting and finally how to correct our problems in body naturally. Ayurveda says prevention from disease is better than cure. Enjoy the delicious yogic food from our kitchen, Indian Vegetarian food, with rice, local vegetables, lentils, salads. Students are guided on how to optimize and adjust the poses, as well as some variations for the difficult poses by the use of blocks, bolster, belts, supporting wall, sand bags in order you can find the benefit and improve the postures more effectively. In the Teaching Methodology, teachers will guide you on how to perform/ conduct an efficient class from the beginning to the end especially for those who interested to be a good Yoga Teacher. The evening Yoga class, will be in a little flow Vinyasa comprising some advance postures gradually added by third or fourth week to make you more sweats, detoxify and refreshed. The Meditation class by end of the day - helps to bring complete relaxation, after all day of classes. 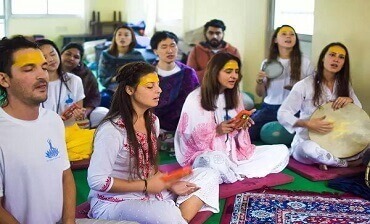 In every day and week different way of Meditation techniques are taught such as sitting, standing, dancing, sleeping – Silence, Candle, Osho dynamic, Yoga Nidra, Mantra Chanting and Chakra Meditation. Dinner is served in Indian style mostly– chapatti, vegetables and yummy delicious soup of the day. In order to pamper our International students not to get bored with same cuisine, we are also serving Chinese cuisine - noodles, Western cuisine – pasta, macaroni, spaghetti or burgers. Students may take a walk after dinner and however Ashram door will be closed by 9.00pm the latest – it’s the bedtime now – as early to bed helps early to rise. Note: - In the process of evaluation and certification, discipline is a key factor. Attending all classes is compulsory and with full attention and respect. Students are evaluated by assignment test by 3rd week, theory test 4th week and practicum test. Certification will be on the 25th day with cultural Closing Ceremony and Puja by taking blessings from our Guruji Swami Yogananda the founder who always stay in our memories.